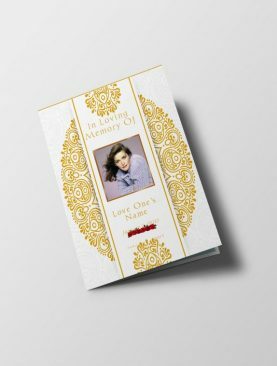 The notable perspective of this given Funeral Program Template is looking extremely beautiful and respectable that is holding a size of 8.5″ x 11″.The shading that it is having out of sight is “adding the quills to one’s top”. At the base right of this layout, beautiful bunch of yellow roses can be seen that are known for having their own particular dialect. Yellow color of flowers delineates a sensitive signal of communicating a sympathy. The light clouds prevailing in the sky indicates the current situation of your mind. 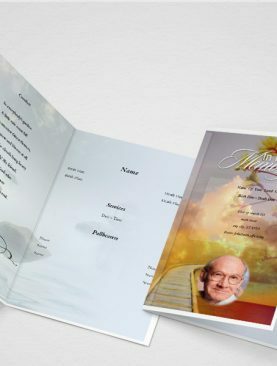 The main color of this amazing template is blue that combines with the sea giving a very realistic outlook to this funeral program template. Text boxes are fully customizable and easily usable. The notable perspective of this given Spangle Funeral Program Template is looking extremely beautiful and respectable that is holding a size of 8.5″ x 11″.The shading that it is having out of sight is “adding the quills to one’s top”. At the base right of this layout, beautiful bunch of yellow roses can be seen that are known for having their own particular dialect. Yellow color of flowers delineates a sensitive signal of communicating a sympathy. 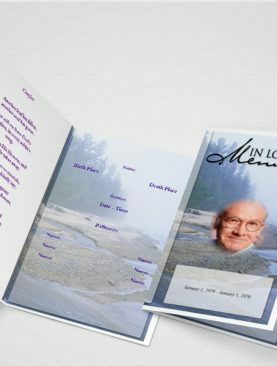 Funeral program template is a useful and less time-taking way to manage things, when you are not in a condition to manage your things normally, because of the sudden departure of someone, who was close to your heart. 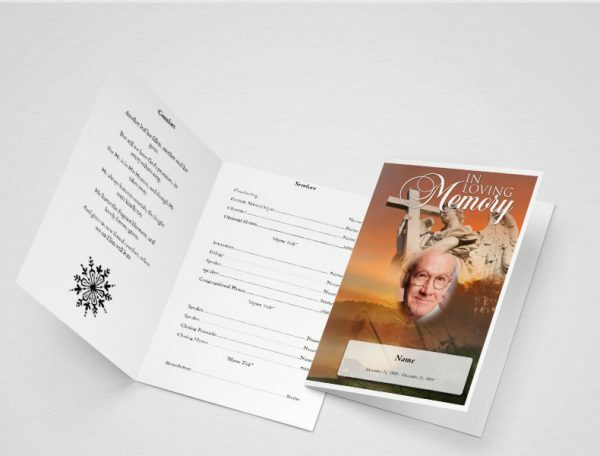 A funeral program template is a document, which has been designed to deliver the news or funeral bulletin. 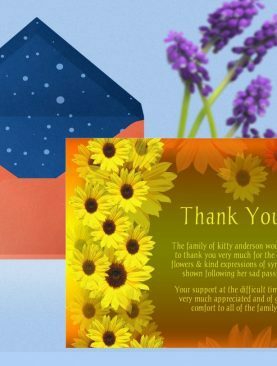 The templates are present in various designs, which are great help for people to customize and personalize their desired template. Even the MS Word, Microsoft Office Word too has its own set of funeral templates that endless people from around the globe are very commonly using. Funeral program templates offer easy customization, which one can use as per one’s individual requirements. These are regular, very common designs, which might seem awkward, after reviewing the final copy of the document. 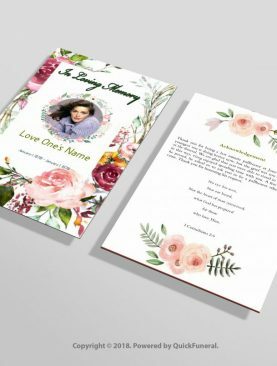 There are actually many other designs and sizes of programs that a funeral director will help you with. 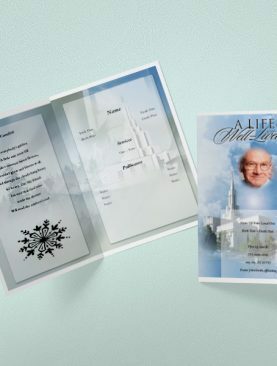 You can also shop online with a variety of sites that specialize in helping you to design programs and will have many funeral templates for programs available for you to choose from. A longer obituary may get into more details about the deceased, like sharing their hobbies, faith, marriage, and early career beginnings. 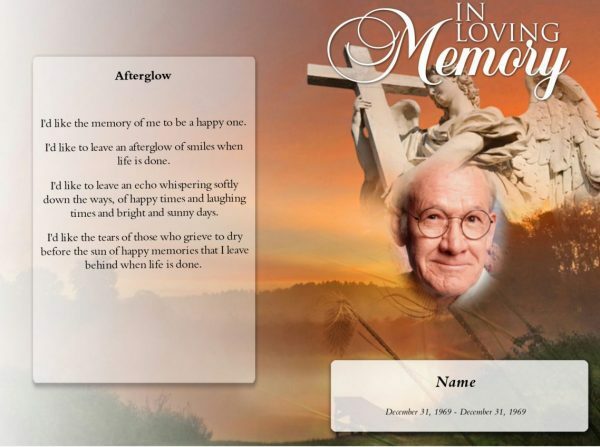 The best thing to remember when writing an obituary is to write in celebration of your loved one’s life. Write as if you were sharing your loved one’s life in chronological order of events to another person. Your obituary will be treasured and reread by many people who were a part of the decease’s life. We thought, you will love to see more matching options by matching your current selection. 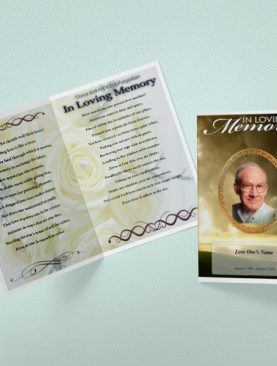 Try these templates to get the last journey of your loved One's more memorable.